"If I wasn't so annoyed with all this, I think I'd be amused." You'll probably never encounter a hedgehog as revered as Sonic. The blue blur speeds through any and all obstacles standing in his path, protecting those around him with relentless vigor. When he runs up against characters from another universe though, things get a little tougher. 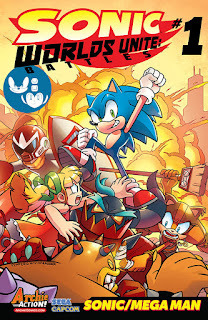 Sonic: Worlds Unite Battles #1 from Archie Comics pits him against that other universe in Capcom. The issue is written by Joel Enos, illustrated by Tracy Yardley, colored by Matt Herms and lettered by Rachel Deering. There are so many epic battles in the SONIC/MEGA MAN crossover event that the biggest brawls of the bunch have exploded into their very own book! Twelve issues just isn’t enough to contain all the frantic action of “Worlds Unite!” The action spills over into this second special stand-alone issue where an all-star cast of creators bring you an extraordinary all-action issue! Watch as Sonic battles the Deadly Six, Knuckles throws down with Break Man, and Sticks… goes after Roll?! LET’S GET READY TO RUMBLE! Sonic: Worlds Unite Battles #1 is an interesting extension of the Sonic/Mega Man crossover, as it offers up some pretty unique match-ups. All three are written in a way that gives the book more of a Sonic feel, with Enos relying on the humorous tone typically found in Sonic books. All three match-ups are unpredictable in their own ways and Enos keeps the reader on their toes by crafting the script this way. Each of the stories also offer fairly bombastic battles, as Enos gives all the characters a chance to flex their signature styles and moves as a part of the combat. Enos doesn't really try to tie the three stories together in any way other than the battle/crossover aspect of it, but he doesn't need to as each story work on its own. Sonic: Worlds Unite Battles #1 is a very vivid book. Yardley does an excellent job rendering all the characters in a way that makes them pretty easily recognized, while also crowding each panel with a ton of action and effects. The page layouts are varied and effervescent, allowing Yardley to capture everything from the speed of Sonic to the intensity of Break Man. There's one particularly noteworthy, full-page illustration in the Sticks vs. Roll battle that really emphasizes the insanity of these battles. Herms' colors are very bright and varied, providing a fantastic, cartoony feel to the proceedings. Sonic: Worlds Unite Battles #1 is a pretty airy issue that doesn't ask much of its reader, save for sitting back and enjoying the ride. The Sega and Capcom universes are definitely rife with memorable characters and blending them together makes perfect sense. Enos' approach is pretty lighthearted and taps into the atmosphere of the Sonic characters more than anything. Yardley's illustrations are family-friendly and tap into familiar looks and characters with appearances that don't stray too far from the familiar. 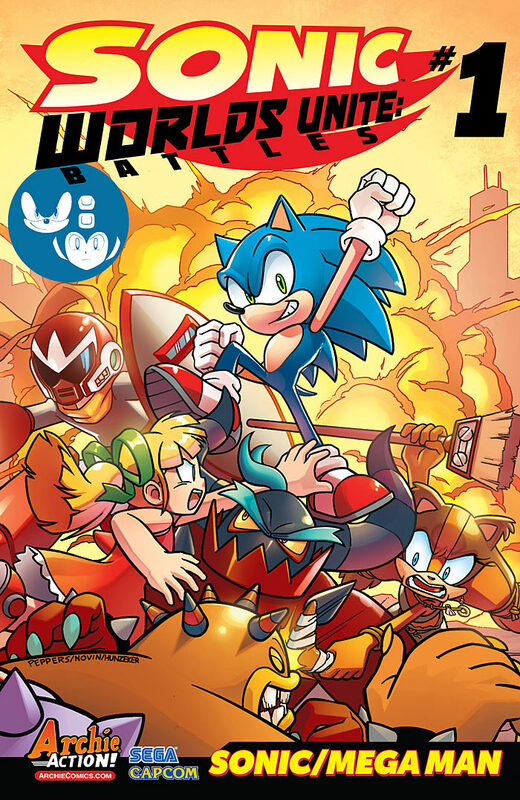 Sonic: Worlds Unite Battles #1 is enough of what you'd expect from a crossover book such as this. Sonic: Worlds Unite Battles #1 is in stores now.